Modern, spacious house with open plan living and great indoor-outdoor flow. Situated among the Russell Cottages in the centre of town. Plenty of room for the whole family. Enjoy the swimming pool, spa pool, playground and BBQ area. All located with in the secure grounds. Off-Street parking for two cars as well as limited boat parking. Only a few hundred meters to the launching ramp. Walk to shops, cafes, bars, ferry wharf and waterfront. 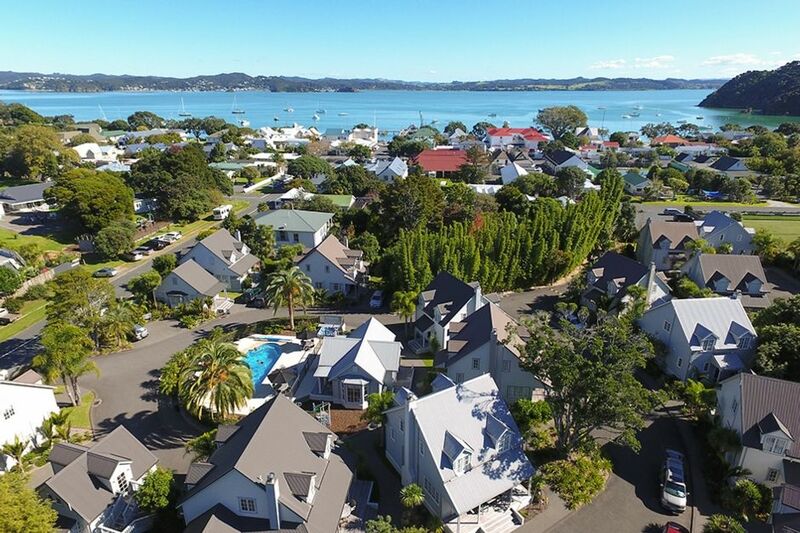 Russell is a quaint and historic town in the Bay of Islands. It is rich in history dating back to early settlers. Many original buildings still stand within the village. We know you will enjoy the tranquility and the beauty of Russell and will not want to leave! For those balmy summer days and nights in Russell, we have installed two heat pumps (air conditioning units) to keep the Cottage at a comfortable temperature. In winter those frosty mornings will not bother you as you sip your morning coffee in the warmth with the heat pumps running on warm. With three bathrooms there's no waiting for a shower or toilet when the house is full. Open plan lounge, dining kitchen with great indoor outdoor flow through two sets of double opening French doors. Double french doors open into a private sub-tropical garden. Native birds feed in the Kowhai trees and Cheeky Wekas run around on the lawn. Just a few minutes walk to the beach. Located on the flat in the heart of the village you can walk to beach, shops, cafe's and resturants. Free WIFI is available. But please note that the speed can be slow sometimes. North facing deck leading off lounge and master bedroom. I stayed here with my friends and we loved it!!! We definitely want to comeback and stay. Pool and Spa pool located within the Russell Cottages.